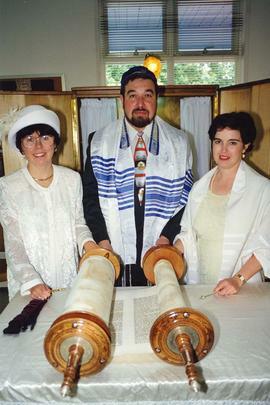 Photograph depicts Sandra Hochstein (left), Grigori Khaskin (middle), and Sharon Sheppard (right) standing in front of a torah. Photograph depicts Grigori Khaskin, Sandra Hochstein, and Sharon Sheppard standing by food table. 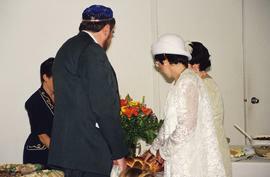 Photograph depicts Sandra Hochstein (left), Grigori Khaskin (middle), holding a yad, and Sharon Sheppard (right) standing in front of a torah. Photograph depicts a group of people surrounding a "Happy Bar Mitzvah" sheet cake as two people cut into it.Written on the verso: "T2097-22A. 13 Dec/81. 1 1/2 x 2 3/4. Brier Home. Dec 31/81." Photograph depicts five unidentified men.Written on the verso: "2 cols Page 5. July 17/75. Bar-mitzvah at Lubavitch. 80." Certificate of Bar Mitzvah presented by the Congregation Beth Israel to Eli Theodore [Teddy] Fromson on January 24, 1953. Series consists of bar mitzvah and bat mitzvah certificates.